Sorry... the 2017 Jeep Compass is no longer being sold as new. Instead, take the first step to a great deal on 2019 Jeep Compass with a free price quote! The new Jeep Compass compact SUV replaces the decade-old "Compatriot" twins, the Jeep Compass and Patriot SUVs that rolled out in 2006 on a platform developed by DaimlerChrysler and Mitsubishi, and are having a short 2017 model year. In size, and likely in price, the new Compass slots into the Jeep SUV lineup between the almost mid-size Jeep Cherokee and new subcompact Jeep Renegade. It is a key product for the brand, fitting squarely in the hot compact SUV segment but with a distinct Jeep flavor: a more rugged look and at least some models with more off-road capability than the competition. It will be offered in four familiar Jeep trims: Sport, Latitude and Limited, as well as an off-road-oriented Trailhawk. The Compass is instantly recognizable as a Jeep. 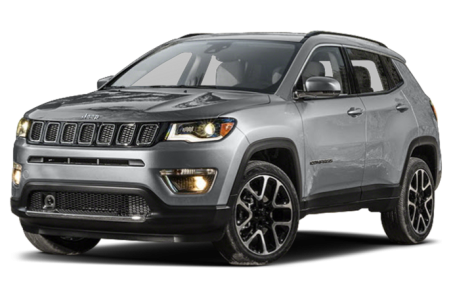 If you mated a Grand Cherokee and a Cherokee, you might get this youngster; it has styling cues from each model in its side character lines and squared wheel openings. It sits wide with muscular haunches and has a Cherokee-like kicked-up beltline, but it eschews that model's eccentric headlight design for a seven-slot Jeep grille and headlights more like the Grand Cherokee. Like both those models, the new Compass' LED taillights wrap into the liftgate, which is available with power. Roof options include stylish, chrome-trimmed gloss black or an anti-glare decal on the Trailhawk. The more aggressive Trailhawk version also gets skid plates and its own bumper designed to offer a 30-degree approach angle and 34-degree departure. It also sits almost an inch higher for a 24-degree breakover angle. And it wouldn't be a Trailhawk without Jeep's signature red tow hooks front and rear. Inside, the family resemblance continues with the six-sided pod in the center dash housing air vents and the 5-, 7- or 8-inch display; Fiat Chrysler Automobiles' latest generation of the Uconnect multimedia system with Apple CarPlay and Android Auto smartphone integration is available. Also available is a configurable 7-inch driver information display that Jeep boasts is the segment's largest. Charging and connectivity ports sit ahead of the traditional lever shifter with an open cubby for smaller devices and a mesh pocket for larger ones on the side of the console. The dash has a logical layout and the interior has a good-looking, clean design with interesting shapes and textures and color accents on upscale models. All models will be powered by a 2.4-liter four-cylinder engine that puts out 180 horsepower and 175 pounds-feet of torque, has a stop-start system and will be good for up to 30 mpg, says Jeep. It will be mated to three transmission offerings and three drive systems. A six-speed manual or six-speed automatic will be offered on front-wheel-drive models; all-wheel-drive models will have FCA's nine-speed automatic or a six-speed manual. The two AWD systems offered are the Jeep Active Drive full-time 4x4 system and the Jeep Active Drive Low full-time 4x4 system (standard on the Trailhawk) that includes a 20:1 crawl ratio. Both systems can send 100 percent of power to a single wheel and feature a disconnecting rear axle and power takeoff unit to improve fuel efficiency. Both systems also include a selectable drive mode with Auto, Snow, Sand and Mud options, plus a Rock mode on the Trailhawk, which also has selectable speed and hill descent controls. Available safety features include a backup camera with dynamic lines, forward collision warning, lane departure warning, blind spot monitor and rear cross-traffic alert. 69 of 70 (98%) consumers said they would recommend this vehicle to a friend.